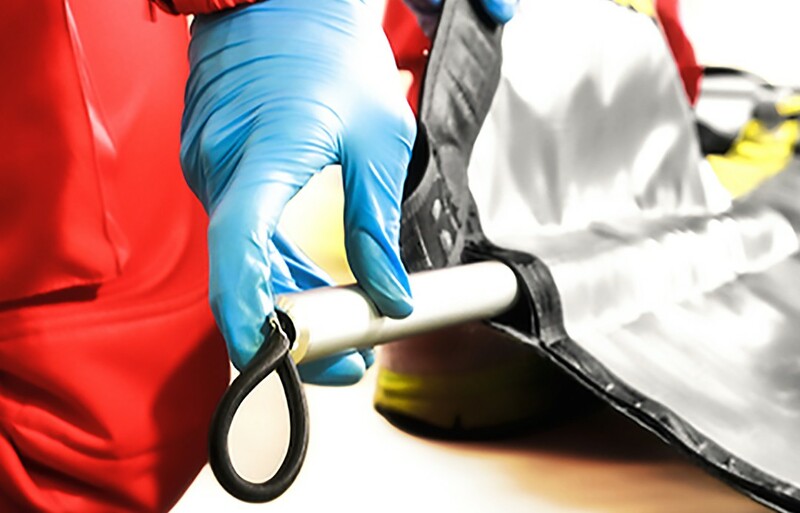 Safety of the injured during transport in confined spaces is no longer a dream. Here we are with a device that improves the most basic of transport systems: the transfer sheet. Rescuers who have to transport elderly or non-traumatic invalid patients have two problems to deal with: space and cooperation. Confined space is a typical problem in urban areas. Not all buildings have nice large staircases and it doesn’t make the job easy for those paramedics who need to use transport chairs, stretchers or spine boards. Patient cooperation is an even more frequent problem that the rescuer has to face. In particular transporting the elderly or scared, or patients who can’t move, (quadriplegic or bedridden people), or those with impaired movement (hemiplegic, paraplegic people or individuals undergoing functional recovery). Another totally unpredictable element is fear, which can induce the patient to make the wrong movements at the wrong time, causing problems to even the most expert rescuer. As every rescuer knows, the most complex part of this kind of patient transport is the transfer from bed to ambulance. Just think about an elderly bedridden person who lives in a small flat in the town center. He’s on the second floor and the staircase is just 90 cm wide and of course there’s no elevator. In this kind of situation you have only two options: a transport chair or a transfer sheet. The first hypothesis is the easiest (especially if your ambulance is equipped with the innovative Spencer 4BELL), but the patient has to be sat up, lifted on the chair and he/she has to be able to collaborate with paramedics. That is why the less considered transfer sheet represents the one and only way to transport a bedridden person. It is a device that should never be missing on an ambulance even though, until today, it has the inconvenience of being very difficult for the paramedics to manoeuvre and at the same time it is most uncomfortable for the patient. However things are about to change. A few months ago Spencer launched an impressive innovation. It’s called WOW and with its 5 simple and intuitive patented innovations, it’s a total revolution for transport in difficult situations. The new WOW by Spencer device innovates and improves the common characteristics of a normal transfer sheet. First of all it guarantees that the patient will remain calm whereas the classic nylon sheet with 6 handles does not give the patient a safe feeling. WOW, with its “angel shape” prevents lateral vision and the patient has two grab-handles to hold that will keep him nicely tucked up and avoid him waving his arms around in search of a handrail or worse, trying to grab on to the rescuer’s arms or trousers. The grab handles are another important element that make WOW revolutionary. These attachments guarantees stability for the patient and avoid the common, irritating sensation of “floating away”. The system of removable aluminium bars also give a big contribution to solving the problem of instability as they give WOW the rigidness necessary to avoid the typical “drowning sensation” that patients feel. These bars reduce flexion by up to 70% and the increased stability added to the use of grab handles helping to keep the patient compact, is immediately transformed into improved collaboration and less panicking from the patient. Another frequent problem during transportation of the elderly to the ambulance is dyspnoea which of course is not aided by the lying down position where difficulty in breathing is increased. With partial removal of the aluminium bars, WOW can even be turned into a chair. An extremely useful configuration to solve the problems of narrow corners and winding staircases. The transfer sheet is not a device that rescuers like to use frequently because the hold concentrates weight on their wrists and lifting is painful and his balance is easily lost. WOW is equipped with two shoulder straps and the weight is much better distributed offering the support essential to the rescuer in transport operations,. The weight load will be distributed on the stronger muscles, (deltoids, trapezia, dorsalis, abdominals and quadriceps) and arms will no longer be the only limbs which sustain the patient. These movements will not only make muscles work correctly (reducing the risk of injury for the rescuer) but it also increases the rescuer’s mobility as he can even take his hand away from WOW if necessary. WOW is studied to load patients of up to 150 kg of weight in compliancy with the European legislation regarding the manual handling of loads. WOW is equipped with 10 handles which allows up to 5 rescuers to operate it. The position of the handles and the system of weight distribution, (along with the aluminium bars), make Spencer WOW a semi-rigid sheet perfect for difficult transport. Rescuers who tested WOW during the third edition of the Spencer Day all had the same reaction: speechless. Spencer call it “the WOW effect”, a sign of this brilliant and simple revolution. This is a recurring question when rescuers see WOW in action. Can WOW protect rescuers? Can it be a way to avoid back pain even in difficult transport situations where no other device can be used? The answer is “yes, it can” because using WOW you will activate a closed kinetic chain that uses more muscles and by making the correct movements, injuries will be considerably reduced. WOW offers a considerable number of innovative solutions, allowing different configurations and cooperation between 2 to 5 rescuers. It can be used with or without shoulder straps. It can be used as a stretcher with the aluminium bars fully inserted or in a sitting configuration when they are partially extracted. WOW can be adapted to every kind of need and protocol guaranteeing the respect for European norms for both patient and rescuer safety.